A pretty falls which normally has low flow. 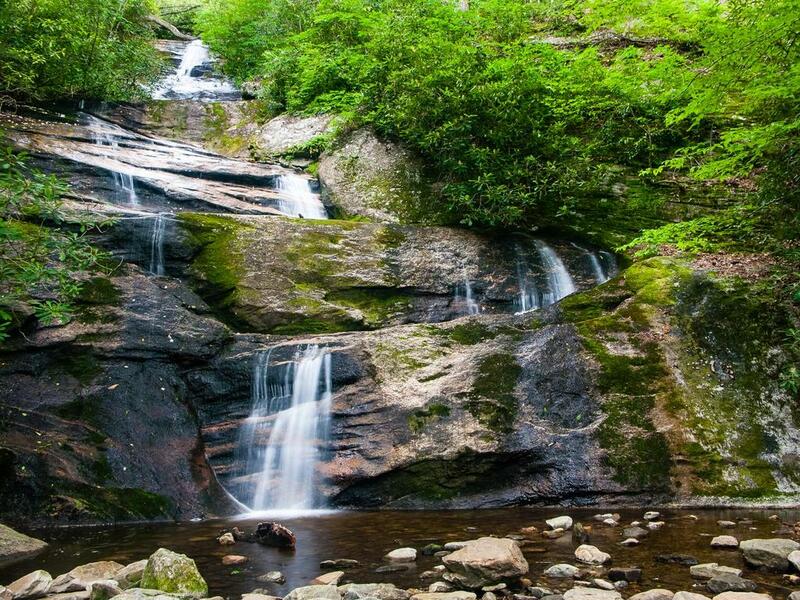 During those times, the creek splits into multiple cascades as it comes down its 3 main sections. Excellent for families with kids to visit as the pool at the base is relatively flat, safe and fun. Setrock Creek Falls is located in the Black Mountain campground. Parking is available across from the campground entrance for non-campers (hikes to Setrock Creek Falls and Mount Mitchell both start within the campground). From the intersection of NC Hwy. 80 and the Blue Ridge Parkway, go West on NC 280 for 2.2 miles. Turn left on South Toe River Road (there is a sign for Black Mountain Campground). Past the golf course, the road turns to gravel and becomes FR 472. Bear right at the next junction (there is also a sign for the campground here) and reach the campground at 2.8 miles. Parking is on the left. Hike across the road bridge into the campground, then bear left on the first road. Go 360 feet and turn left onto the trail by the river - there are signs for the Group campground and the Mount Mitchell trail (this is the Briar Bottom Bike Trail, but it's open to hiking, too). The Mount Mitchell trail is on the right after 0.15 mi; continue straight. Go another 0.1 mi, over a bridge. Take the Setrock Creek trail on the right. It's about 0.2mi from there to the falls, moderately uphill; you'll cross the Briar Bottom Campground gravel road on the way.